Since January, the media has been abuzz with stories about a mysterious phenomenon called Colony Collapse Disorder (CCD). Beekeepers in 23 states have been finding their hives empty, with no evidence of why their colonies disappeared. The cause of CCD is still unknown. Explanations about what is causing these disappearances vary widely; leading theories blame pesticides, unknown pathogens, and genetically modified plant pollen. Some suggest the disease may not be new. Regardless, the scare has brought attention to the important role that insects play in our food system as vehicles for pollen to travel from one flower to another. More than 30% of food crops depend upon insect pollination, among them blueberries, summer and winter squash, melons, cucumbers, peaches, almonds, cherries, plums, apples, and pears. While farmers once relied heavily upon some of the over 4,000 species of native bees and other insects for pollination, European honeybees became the predominant pollinator after the advent of industrial agriculture. Wild populations are not nearly as manageable as domesticated honeybees; they often nest in the ground or in trees and cannot be easily transported—nor do they provide an abundant honey harvest. Much like migrant farm workers, honeybees often come from afar and travel (by truck) from farm to farm (“following the bloom”) to perform their critical role in our agricultural system. Beehives are shipped across the United States in semis and from other countries on cargo boats. 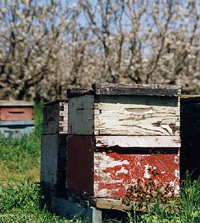 Over half of the commercial hives in the United States are in California’s Great Central Valley from mid-February to March. It’s no wonder that the sudden disappearance of 25% of our country’s honeybee population is cause for concern; no honeybees means a poor harvest. The current honeybee crisis, which is just the latest step in the continual decline of populations of honeybees and other pollinators in North America, has provided the impetus for the introduction of two pieces of legislation to Congress. The Pollinator Protection Act, if passed, would provide funding for research and protection of European honeybees. The Pollinator Habitat Protection Act is an amendment to the Farm Bill to include money for pollinator habitat protection in the Conservation Reserve, Conservation Security, and Environmental Quality Incentives Programs. Without healthy pollinator populations, politicians are recognizing, America’s agricultural industry and food security are threatened. Though most growers at the Ferry Plaza Farmers Market whose crops need insect pollination rent or keep hives of European honeybees, some have come to depend on native insects. John and Armen Carlon of Sierra Cascade Blueberry Farm haven’t rented hives for five years. Instead, they rely on a native and more effective blueberry pollinator—bumblebees. Four different species of bumblebees feed on the nectar and pollen of the farm’s blueberry crop, and they provide all the pollination necessary for a healthy harvest. The Carlons have about 1,100 plants on each of their 8 ½ acres, and during pollinating season, there are 2 to 4 bumble bees on each plant—that’s 18,000 to 37,000 bumblebees buzzing in their fields during flowering time. The bees nest on the Carlons’ 50 acres of uncultivated land, many colonies making their homes in abandoned gopher holes. John laughs as he tells how their reliance on bumblebees as pollinators has transformed their attitude towards gophers. Once viewed as pests, gophers are now regarded as important habitat creators. As the Carlons have done, farmers can encourage native pollinators by leaving land wild so that insects have a place to nest and year-round forage. Some researches estimate that if farmers left just 10% of their most marginal soils uncultivated, they could achieve 40% pollination by native insects. On Eatwell Farm, researchers from UC Davis are currently looking at the unusually high populations of native bees and other beneficial insects. Diverse farms like Eatwell attract diverse pollinators, and pollinator polycultures, like crop polycultures, provide insurance against diseases and other contingencies.